This blog post is part one of a two-part series written by guest blogger, T.K. Hoffman. Click here to read part two. Michael Sharp and Zaida Catalán, two U.N. investigators, went missing in the Kasai region of the Democratic Republic of the Congo on March 12, along with four colleagues: Betu Tshintela, Isaac Kabuayi, and two unidentified motorcyclists. The UN confirmed the deaths of Catalán and Sharp on March 28 after the bodies were found outside the provincial capital of Kananga in Kasai-Central. Catalán and Sharp, whose mandate was to monitor Congo’s conflict dynamics and human rights violations, were in Kasai investigating ongoing human rights abuses and violent clashes between various militia and Congolese army units. Two days before Catalán and Sharp were confirmed dead, officials reported that militia killed and beheaded 42 police officers at a roadblock between Kananga and Tshikapa. Nearly two dozen mass graves have been discovered throughout the countryside of Kasai since the conflict began back in August 2016. Now at the beginning of April 2017, the escalating violence in Kasai has devolved into an insidious civil war and suddenly, even Congo’s so-called “Oasis of Peace” has fallen into wanton chaos. This two-part blog series aims to shed light on wider violence in the Kasai region based on recent field reporting carried out there. The disappearances and killings of the investigators highlight the risks involved in documenting human rights violations in the area. They also emphasize the ongoing need for such reporting. The following is an analysis of the violence distilled from conversations with civilians on the ground. Given the Congolese state’s tendency for retaliation and local sources’ requests for anonymity, no names or identifying details are shared. One key theme that emerges is that the current conflict in Kasai is strongly linked to the overall political crisis in Congo. Deep frustration against the state and the lack of progress on a democratic transition have sparked an escalation in regional tension and retaliation against the state. The December 31 agreement must be implemented to help resolve this wider crisis – before it is too late and violence between militia and military forces spirals even more out of control. At some points, the gunfire becomes so consistent that it merges with the sound of construction elsewhere in the neighborhood, just another fragment of the background noise in Kananga, the capital seat of the Democratic Republic of the Congo’s Kasai-Central province. Since August 2016, this region of Congo has become an informal war zone between the Congolese army and various militia groups. There are rarely any clear sides or stories to this violence. Even calling the groups of fighters by the title “militia” is misleading. Their members are often not guerilla fighters from remote, well-established rebel camps, but civilian-turned-fighter adolescents swayed by witchcraft’s promise of invulnerability and motivated by anger at government regimes that have neglected their needs and prolonged their poverty for decades. It can be hard to describe a conflict in a region where there are few live Twitter updates and where the vast majority of investigative reporting is sponsored by a repressive state. Almost all news is passed by word of mouth, except for the occasional state-directed radio broadcast, whose reporting is partial and unreliable. Fact and myth blur in interviews with eyewitnesses, with testimonies of civilian murder and military deployment intertwined with tales of sand that turns to fire, sticks that turn to machetes, and militia fighters chanting as they advance and turn back the tide of bullets onto their aggressors. According to militia members, the primary driving cause for the conflict in the Kasai region is a quest for more equitable distribution of Congo’s wealth and regime change. The “militia” is often referred to as a collective unit, but is actually made up of fairly disparate and disorganized groups of discouraged adolescents led by assorted faction leaders. The militia are united by their youth, their unemployment, and their frustration with the government, who they see as responsible for squandering public resources and stalling development in Congo, especially to the detriment of remote regions like Kasai. These disenfranchised militia members perceive that other provinces have received more resources from the state in terms of roads, water sources, and electricity, while Kasai, an historical hotbed of political opposition since Mobutu Sese Seko’s time, has been purposefully neglected. Despite this, Kananga had garnered a local epithet as the “Oasis of Peace” in the Congo, for its peaceful antagonism towards the central government. 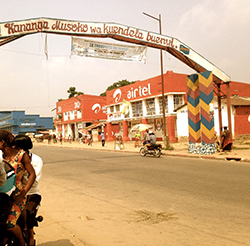 Even as other cities and provinces have fallen into violent conflict against the state, Kananga and the Kasai region have remained relatively peaceful for decades – until now. In some ways, the militia’s grievances are well-founded: since Mobutu’s time, the state has invested in new roads and water sources elsewhere in the Congo, while allowing the roads of Kasai and Kananga – the latter once a bustling metropolis of the Belgian colony – to fall into disrepair, some say in order to punish the political regime’s opponents. This is a policy that President Joseph Kabila’s government has not tried to reverse. The state may have made a critical mistake in presuming that the “Oasis of Peace” was a static condition for Kananga, one that can still be counted upon despite years of accumulated neglect. The current conflict is the result of frustration against the state that has been mounting in Kasai for decades. National level instability in the fall of 2016 has served as a match on the tinderbox, providing a catalyst for the regional anger to spill over into violent action. While these grievances may be the primary driver of the militia’s protest movement, the contingent causes of the conflict – ones that spur the militia into action day by day – are interference by the state on a local level. The event that first set off this violence last August was when the local chief of the now infamous Kamuina Nsapu village in Kasai-Central discovered that police had raided his house while he was away from his village. The facts related to this event are extremely difficult to verify, since much of the information is a result of rumor, and even the most authentic testimonies can become warped by state radio reports. But almost all sources seem to agree that the police conducted a raid on the household of Kamuina Nsapu’s chief, who had been quite outspoken about wanting minimal state interference in his region. According to reports from locals, the chief believed that the state should not have the right to tax or police people living under his sphere of influence; he believed that this power, instead, should lie with him. Speculation is rife about whether the chief’s agitation against the state may have provoked the assault on his household, but what seems certain is that the raid was the final straw in a series of mounting confrontations between national and local power in Kamuina Nsapu and served to only further aggravate tensions in the region by catalyzing the initial rise of the militia. This first clash between military and militia, far out in the rural villages of Kasai-Central, resulted in the death of Kamuina Nsapu’s chief and a military victory for the state. But instead of crushing the revolt, this show of force by the state has engendered a fierce spirit of resistance in the discontent youths of the region. The militia rose up twice more in 2016, both on occasions tied to political instability at the national level that presented opportunities for militia to express local discontent. First, in mid-September 2016, the militia invaded Kananga and shut down its airport, just three days after Kinshasa erupted in riots to protest that the state claimed to not have enough resources to hold a national presidential election for in December. In Kananga, fear of the invading militia spurred stampedes and looting over multiple days in mid-September. Several civilians died in the resulting chaos, trampled underfoot in the stampedes or from jumping off of roofs in terror. An increased military presence in the region throughout the fall restored some order until mid-December 2016 when President Kabila was supposed to have transitioned out of the presidency. Instead, President Kabila mounted a campaign of repression and stalled elections, and managed to remain in power beyond his constitutional mandate. Again, national level instability and protests in Kinshasa and Lubumbashi led to another invasion of Kananga by the militia, who took advantage of the uncertainty fueled by the constitutional crisis to forcefully express their local displeasure with the current regime and rally their local forces to combat the state. For three days, the militia undertook a destructive campaign of looting, prison breakouts, and arson of state infrastructure in Kananga, until the state gathered the forces, once again, to violently restore order. This blog post is part one of a two-part series. Click here to read part two.